The Tray Transpose Tool software will normally run under Windows Vista and Windows 7 if you install with Administrator Privileges. To do this, right-click on the installer and select [Install as Administrator]. This is usually sufficient to allow the software to install and run properly. If not, follow the steps below for further tweaks that may help. Even if you install as administrator, some Windows Vista or Windows 7 installations may have problems running the Tray Transpose Tool, just because so much has changed under the hood from Windows XP days when this software was programmed. However, there is a compatibility mode that can be easily set. 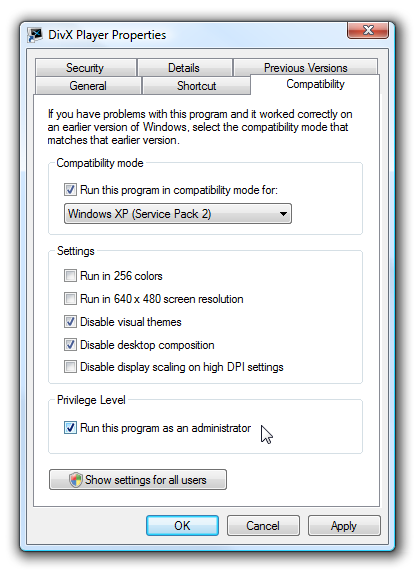 To configure the compatibility mode, just locate the installation directory (it should be [C:\Program Files\Tray Transpose Tool\] and right click on the .exe file, selecting Properties from the menu. Set the program to run in [Windows XP SP2] compatibility mode, and check the [Run this program as an administrator] button.